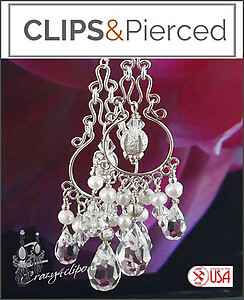 Features:These is a pair of absolutely gorgeous clear crystal chandelier clip earrings. 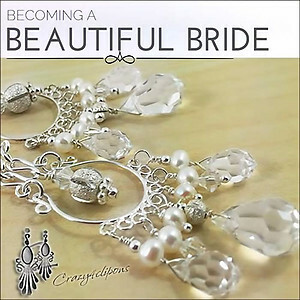 They are jaw dropping and perfect for special occasions and for brides. Light sterling silver swirled hand-wired components are paired with fresh water pearls, crystal teardrops, Swarovski crystals and star-dusted beads. These earrings are beautiful, an exquisite accessory focal point. They look outstanding with strapless or spaghetti strap dress designs. Components are light so the earrings are comfortable. Specs: Fresh Water Pearls, Sterling silver swirled findings, hoops, Sterling Silver daisies, Sterling Silver seeds and star-dusted beads. Czech teardrop crystals, Swarovski bicones.